Rev. Mary Belnap, deacon of the All Saints Anglican Church, at the Inn of the Good Shepherd. Word is out that Mary Belnap shoots from the hip. She’ll listen to your troubles. She’ll take up your cause. She will even help you fill out complicated government forms and never charge a dime. But don’t lie to her. She’ll figure it out and you’ll be on your own. 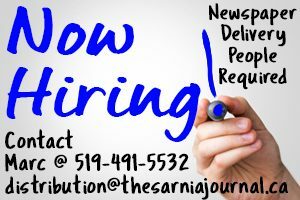 Belnap belongs to the Anglican Church but she’s made herself available to the entire Sarnia community for more than 25 years. She works 40 hours a week, every week, helping those she calls marginalized, never expecting anything in return except respect and co-operation. “People who are on the system are not there because they are lazy. Such a small number are generationally on welfare,” she says. “When people can’t pay the bills or feed their families, it’s not their choice to make their life an open book. Twenty-five years ago, shortly after her husband died, Belnap walked over to her neighbourhood restaurant called The Georgian Shop on Mitton and began making herself available as an advocate to whoever asked. “I didn’t have children and I’d retired early. I decided to make it a full-time job to help others,” she explained. Belnap’s paid career had included four years as a medical clerk with the Royal Canadian Air Force, ten years with the administration department at Polysar and 20 years as an accountant with the VON. After The Georgian Shop closed, Belnap relocated to the Bayside Centre downtown. To this day, she can be found at a table near the food court most Wednesdays, talking to anyone who approaches. On Mondays and Thursdays, she’s at the Inn of the Good Shepherd, accompanied by parishioner William Ehman. “Sometimes it’s just for fellowship, sometimes people need help writing a letter or applying for Ontario Disability. “What I see are people who are stressed out by the unknown, because all the work they can get is just contract with no benefits,” she said. In 2001, at the age of 64, Belnap began taking university courses so she could be ordained as an advocate deacon, a position in the Anglican Church that is unpaid. She felt wearing a collar could help with her advocacy work. Yet the cost of courses in London was daunting for a woman on a fixed income with no car. That’s when Belnap’s church choir chipped in to help her buy textbooks. Other church groups, including the Anglican Church Women, assisted financially. It took her seven years, studying at night and on weekends, to earn a lay certificate in theology. 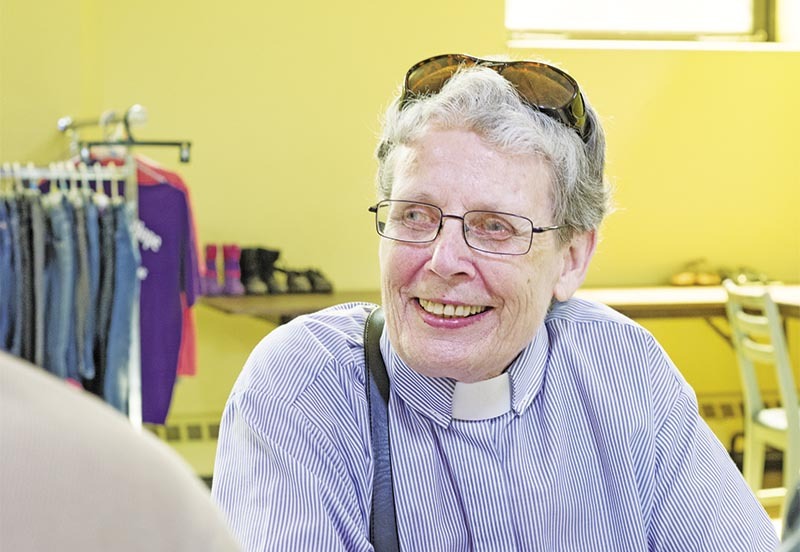 As far as she knows, Belnap is now the only vocational deacon in the Anglican Diocese of Huron, which includes 200 churches in Southwestern Ontario. Over the years, she has spearheaded numerous programs for the disadvantaged including free dental care and eyeglasses. This summer she is preparing for the third year of a lunch program for local elementary school students. And she is distributing a new brochure so more people can find her. Rev. Mary Belnap can be reached at All Saints’ Anglican Parish on Vidal Street, by appointment only, by calling 519-344-5167. You’ll likely have to leave a message. She’s a busy lady.